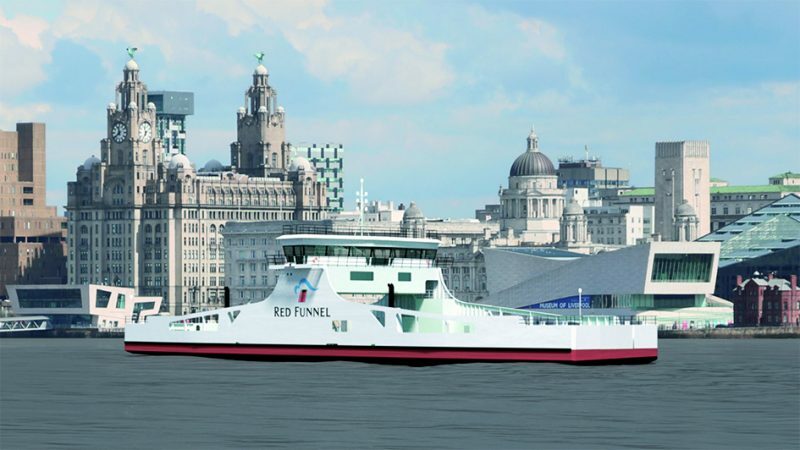 Red Funnel Ferries’ new Ro-Ro ferry Red Kestrel (artist’s impression above) had her keel laying ceremony at the Cammell Laird Shipyard in Birkenhead on the afternoon of 31st May, witnessed by 300 invited guests. Karen George, wife of Red Funnel’s Chairman, had the honour of pushing the button to lay down the first section of the keel, accompanied by the Rt. Hon. Alok Sharma MP, Minister of State for Employment at Department of Work and Pensions, John Syvret CBE, CEO of Cammell Laird, and Kevin George, Chairman of Red Funnel Group. The milestone event was followed by a keynote address from the Minister of State as part of his visit to businesses in the North West of England. In time honoured tradition and as a symbol of good luck, coins, in this case an Isle of Wight silver sixpence dating from 1811 and a halfpenny from 1792 were placed under the keel block. Both coins will eventually be recovered and presented to the Red Kestrel when she enters service. The £10 million order was announced in February 2018 and will be Red Funnel’s first dedicated ro-ro freight ship, providing additional year-round freight capacity on the Southampton-East Cowes route which currently handles 53% of all freight movements across the Solent. At 74m in length, she will provide 265 lanemetres of roll-on/roll-off freight capacity, will carry up to 12 passengers and will be powered by two Cummings Tier III diesels connected to two Rolls Royce azimuth thruster. The ship is scheduled to enter service in 2019 and will be christened Red Kestrel. Earlier, on 15th May, Red Funnel awarded a major contract to Isle of Wight based Stoneham Construction Ltd. to complete phase 1 of the company’s East Cowes terminal redevelopment. Work at the site of the former Trinity House maintenance depot involves levelling the area, adding suitable drainage, black topping the surface and adding lane markings. It is expected the project will be completed and the site commissioned for operational use by late July 2018. At the seaward side of this site will be built a new layby berth where the Ro-Ro vessel Red Kestrel can lay over between freight sailings. 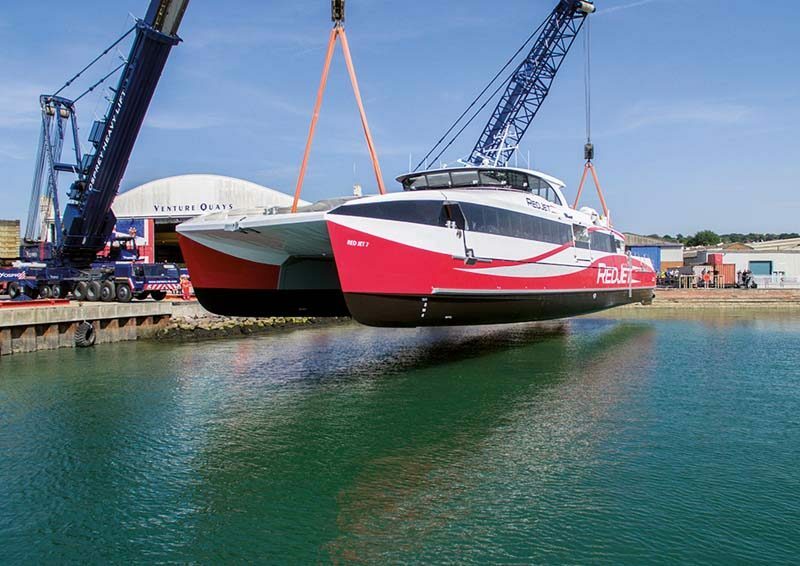 On the afternoon of 6th June the Red Jet 7 was craned into the water at Wight Shipyard, East Cowes prior to completion and sea trials (above). The naming ceremony is scheduled for 24th July. Wightlink’s new flagship, the Victoria of Wight, is also expected to arrive in home waters in July, all being well. She is seen above during sea trials. Naviera Armas has been given the go-ahead by the National Commission of Markets and Competition (CNMC) to acquire compatriot ferry operator Trasmediterranea, but ARMAS will have to comply with a series of conditions. According to the CNMC, the sale posed risks a monopoly situation, therefore Naviera Armas has to accept the introduction to the Motril-Melilla route of German operator FRS Iberia, as well as on the Huelva-Canary Islands link (including the inter-island services) from the beginning of July using the existing ships. These routes had until now been operated by Armas and FRS effectively takes them over completely. 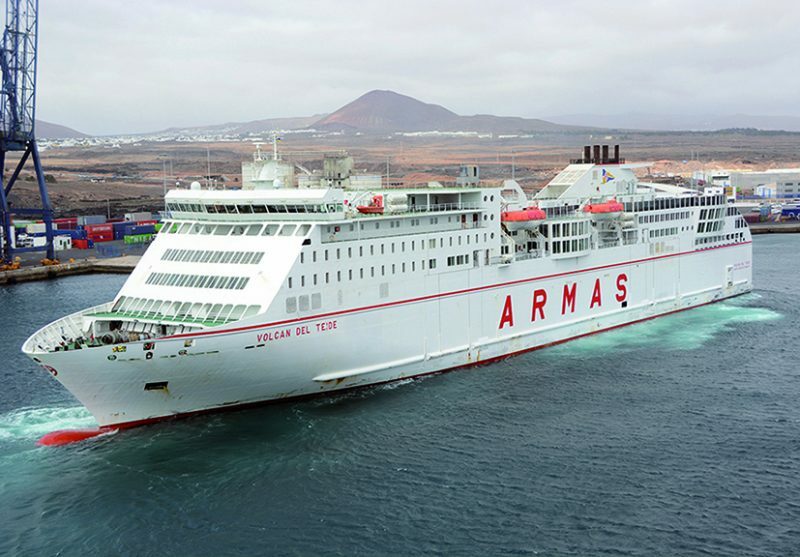 FRS will charter the Armas-owned ferries Volcan De Tauce (9,087gt/built 1995) for the Motril-Melilla operation and the 29,514gt/2011 built Volcan de Teide (above) for the Huelva-Canary Islands route. The expansion of the FRS network is part of the company’s strategic vision of continuous growth and now sees them operating 9 vessels with 800 dedicated personnel in Spain and Morocco.